Facebook marketers are in a constant state of change. Every week seems like a news feed fire drill. As a matter of fact, the infamous news feed might even become an endangered species. Stories — the vertical, ephemeral slideshows pioneered by Snapchat — are now growing 15 times faster than feed-based sharing according to a BlockParty report. So how can brands get the most ROI from a Facebook Page today? Here’s a quick checklist to optimize your Page, increase organic results, and boost Facebook exposure for any size budget. First, we need to let go of thinking Facebook owes us anything. Shrug off the entitlement issues. It isn’t 2010 anymore. Change your perspective. Look at your brand’s Facebook Page as basically a free microsite hosted by Facebook at no charge and you will see more opportunities. Think of Facebook as a search engine and optimize all the components like you would your website content to get found on Google. Just like Google’s famous algorithm changes, Facebook is constantly adjusting and updating. Your Facebook page profile image must be immediately identifiable in the news feed and clearly represent your brand. This means avoid combining horizontal company names and icons. Think square. Keep logos clean, simple and clear. If it’s a personal brand’s public figure Facebook page, make sure it is a professional headshot. What looks awesome on a desktop might not translate well to mobile. Avoid multiple words and trying to fit an icon, company name and/or tagline all in one profile image thumbprint. Design for the news feed. Think of your cover image like you would a magazine cover. Your Facebook Page is like a publication. Just like in a magazine stand or grocery store line, the cover image needs to communicate why someone should pick it up and buy it or hit the follow button. Change cover images out monthly or weekly to represent your brand’s current promotion/theme or story. Take advantage of the video feature and use this to share a customer experience, brag about recent awards or media coverage an even showcase your best demo reel. Be sure to design cover images for the mobile user in mind. When in doubt test it out on mobile to make sure it looks as good on mobile as it does on a desktop. Keep it relevant and timely. Fill in the description with a link back to a relevant place on your website or blog for more info. Be sure to choose an effective CTA. You may have noticed some pages with a grey or blue verification check mark. According to Facebook support, only certain types/category pages are eligible for the gray verification. To get the blue check your brand must fall into celebrity type statuses, such as Guy Kawasaki, or big brands, like Wendy’s Restaurant. Check your Page settings under General to see if page verification is available. If it is, verify it! Why does this matter? Better search results from Facebook. They know you are legit and will favor your brand in results in addition to a potentially preferred rollout of new Facebook Page features. Not to mention the “cred” value of being Facebook verified. Why go with the default design when you can customize your Page for your audience? Facebook gives Pages a way to customize the look and feel of your Page depending on the type of industry or business. You can find templates for nonprofits, politicians, restaurants venues, services, and more. Just like the navigation of a website, Facebook gives brands the option of prioritizing the order of Tabs, even turning some off for a cleaner and more defined Facebook Page tab navigation. Not using the Shop tab? Get rid of it. Are videos your thing? Move that tab to the top. This is equivalent to the About Us section of a website. Here is where you tell your brand story with a featured image. Use keywords and easy to read short sentences, subheads, and bullets. There are options for H1, H2 tags and adding more images. Add tagged links to attract traffic back to your owned media where appropriate and watch Google Analytics to see the results. This is where you can choose a post to feature and “pin” to the top of your Facebook Page’s feed. Consider making “Posts” your top tab so your latest post is upfront and center when someone lands on your Facebook Page. Many times pinned posts get forgotten and remain pinned to the top of the feed for weeks months and sometimes years! So even when you are updating your Facebook Page regularly, if your pinned post is dated, this could give the wrong impression and make it seem like your brand is not active. This is the first thing visitors see when landing on your Facebook Page, so change it up once a week with your latest news and featured promotion. Once taboo to Facebook ad experts, boosted posts now have more purpose and value, especially for a light public relations push. Adding even more fuel to pinned posts is to boost your post or, in other words, turn it into a Facebook ad to get more targeted reach and exposure. By boosting your pinned posts this gives an impression of activity and engagement to new visitors coming to your page. “I used to not recommend boosting posts because of the way the post was optimized around getting engagement only and because you couldn’t reconnect with the people who have engaged with your post. 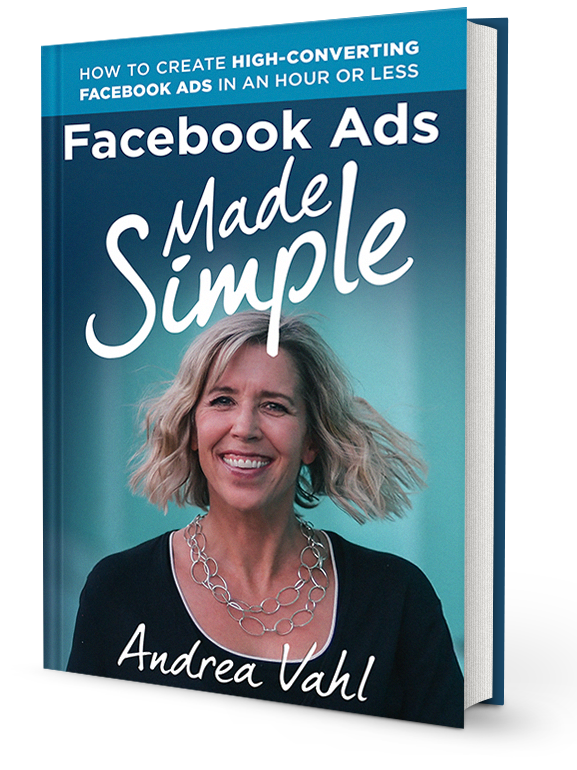 But now with Facebook’s “engagement retargeting” and the fact that you can optimize around driving traffic, the Boost post button is not a bad strategy,” said Andrea Vahl author of Facebook for Dummies and her latest book just released Facebook Ads Made Simple. Boosting posts is essential “Facebook lite” advertising and there are better options in the Ads Manager. But I still boost my own posts and I do see sometimes that a boosted post outperforms an ad created in Ads Manager. Choose a post that has a benefit for you – like a blog post with an amazing visual. Wait at least a couple of hours to let that post get some organic reach and engagement. Make sure that post is already doing well organically before deciding to boost it. Optimize your Objective around your goal. Add the proper targeting (like the warm audience). Choose your budget and schedule. Important: Make sure you have the Facebook Pixel installed so you can capture traffic and also track any conversions from your boosted posts (even though it’s a boosted post you can still track conversion to a sale or lead). Finally, you should always compare your stats and turn your boosted post off early if it isn’t achieving your goals. Currently, you can’t edit the photo that is pulled in when you have a website link as the post – this feature changes on Facebook from time to time so check your options. Don’t have quite as many targeting options as you do with the Ads Manager. Can’t optimize your ad to get more conversions (if you have the Facebook Pixel installed). Not as many placement options and budgeting choices. “So while boosting Facebook posts is easy and can be effective when done right, you should primarily be using the Facebook Ads Manager to run your ads on Facebook,” Vahl said. This might seem obvious but the best time to post on Facebook is when your audience is on Facebook. Check out your Facebook Insights and see the trends of your Page. Instead of posting right at your peak time, try posting a few hours before audience peak time as your audience is building for maximum organic exposure. If you are going to tie in a holiday or a “day of the week” such as #MotivationMonday or Super Bowl Sunday, start the post as early in the day or weekend as possible. Once the “day” or event is over, it’s old news. Get on the bandwagon trend early. Consider avoiding posting on busy event/holidays unrelated to your brand. Plan out a 3-month editorial calendar. In the search marketer’s world, keywords are a staple best practice when it comes to SEO and targeting for PPC. Keywords also matter in Facebook posts, captions, titles, tags, categories, and video descriptions. Even branded keywords in captions are many times a miss in Facebook messaging. Mentioning a brand name or keyword phrase in a caption will trigger that post to come up in a Facebook search. Try it! Search for your brand name in the Facebook search bar and see what comes up. Next, try your competition. One of the biggest fails in optimizing a Facebook Page is forgetting about links. Bringing quality traffic back to your website or blog takes back the power from Facebook and gives you more control to retarget. Image posts work great for engagement – add a link back to your website/blog at end of the caption. Comments under a live video are also a place to add valuable links of information of things discussed in the video. For link posts back to your blog keep in mind the meta title and description is part of the marketing message on Facebook. Add links throughout your About Us, milestones descriptions, mission, Our Story, etc. Make sure the URLs are all updated from HTTP to https in the website fields (check this on all social networks). Facebook is leading the way when it comes to video and while the video is becoming widely adopted with just under 15 percent of brands reporting they do not do any video, it is still hot. We’ve transitioned from native only video to live video to vertical video and now we are in the Watch party phase. Bottom line, Facebook Pages with video content are a survival must for a successful Facebook content strategy. As mentioned earlier, Stories seem to be taking over the social media world. Using images, videos, stickers, and filters – Facebook Stories last 24 hours and are the latest format for content creators. 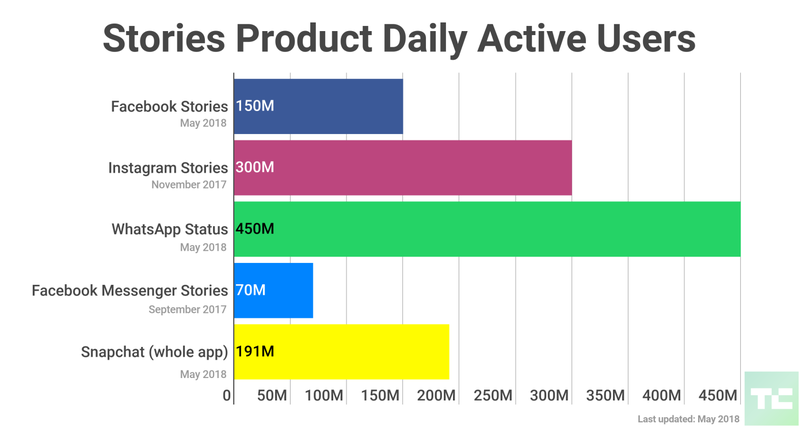 Facebook’s Chris Cox shared a chart showing Stories is expected to surpass feeds as the primary way people share things with their friends within the next year. And nearly a billion users across WhatsApp, Instagram, Facebook, and Snapchat already turn to Stories to share. Hootsuite 2019 Trends Reports takes note: This is far more than just another new format. Social media is pivoting from text-based platforms originally designed for desktop use (think early Facebook) to truly mobile-only networks that enable users to capture in-the-moment experiences — and Stories embody that pivot. Lastly, if we had to pick a last but not least, it’s Facebook Messenger. 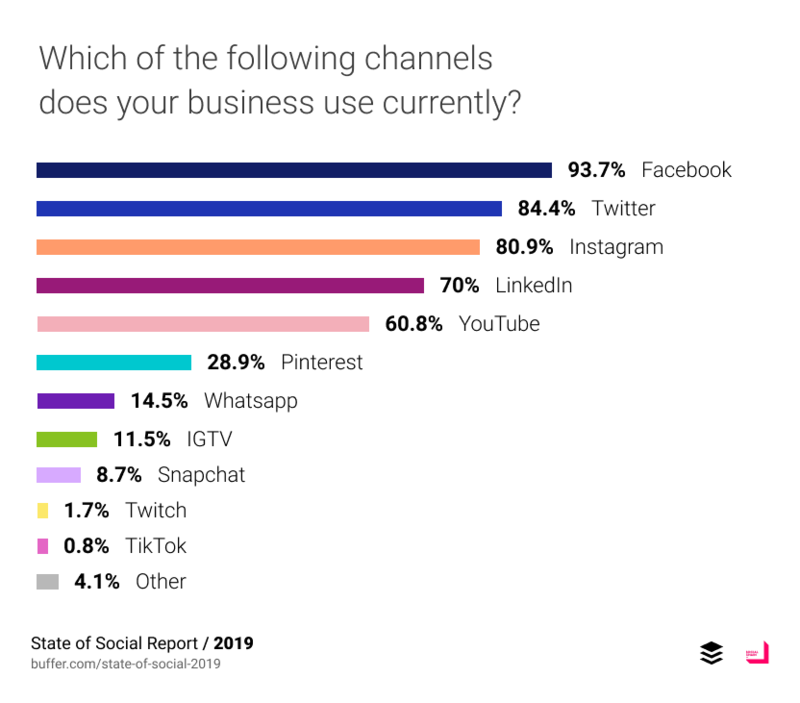 According to Buffer’s State of Social 2019 report, this is tagged to be the year in which more brands adopt messaging as part of their social media strategies. As a basis for your optimized Facebook Page, make sure you have enabled Facebook Messenger customized with an after-hours reply and any levels of personalization you can add to the default messaging. Getting creative and personalized. Did you just get a great write up on an industry publication or was your CEO interviewed in a podcast? Add the link to it in your “away” or auto response message to add a little value to the temporary non-human response. 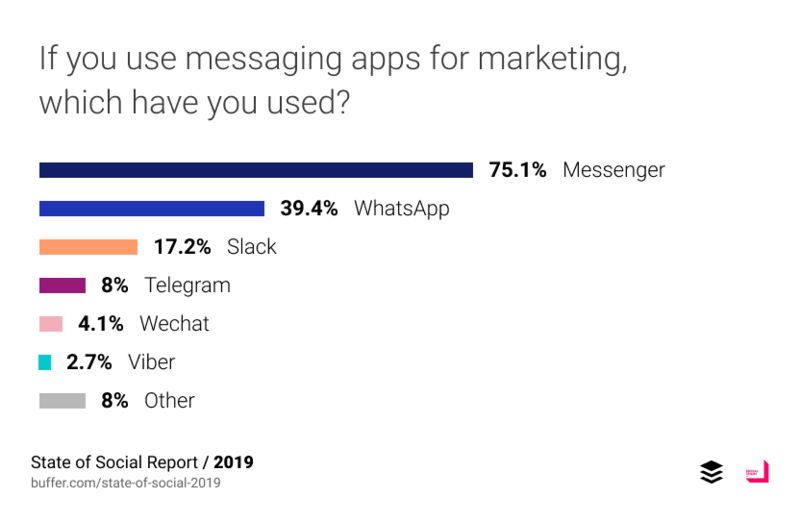 In a Facebook study, 69 percent of U.S. respondents said that direct messaging a company helps them feel more confident about the brand. With 93 percent of businesses using Facebook today, it’s hard to ignore the power of a Facebook Page. Think of your Facebook Page as an extension of your brand’s website or think of your website as an extension of your Facebook Page. Either way, stay in control and in the present marketing moment to reap the future benefits. Your Facebook Page’s past does not equal the future. Read More….. This entry was posted in Social Media and tagged Social Media Agency, Social Media Marketing, Social Media Services. Bookmark the permalink.